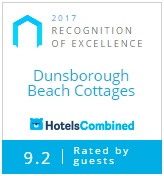 Accommodation Purposes – At Dunsborough Beach Cottages we offer two and three bedroom cottages for rented accommodation purposes only. Functions, large gatherings, receptions, weddings etc are not permitted without prior written approval from management. Should there be evidence of an unapproved function, large gathering, reception, wedding etc, guests will be asked to depart the premises immediately and no refund will be applicable. Everyday Rate - All other times of the year (excluding long weekends). Beachfront Cottages - Adult only retreat (no children), maximum of 4 adults per cottage and a minimum 3 night booking. Extra Guests - Prices are quoted for two adults. Extra guest are charged at $10.00 per night, per person. There is no charge for children under 16 years of age. Each cottage is equipped for a maximum number of guests and it’s against regulations set by the Health Department to exceed this number, where there are not enough beds to accommodate the maximum amount of people. We do not allow extra mattresses to be brought in, tents, campervans etc and should a cottage be overloaded, guests can be asked to vacate immediately with no refund applicable. Booking Policy - 20% of tariff is the deposit required at time of booking to confirm your reservation. Where 20% of the booking is less than $100, a minimum deposit of $100 will be charged. The balance is then due on arrival. Cancellation Policy - $50.00 cancellation fee applies on all bookings where 30 + days notice has been given. Where 0-30 days notice has been given no refund will be provided. However we are more than happy to look at alternative dates at the time of cancellation. Leavers - Unfortunately our property is not suitable for school leavers. Pets - No pets are allowed on the property. Smoking - All cottages are strictly non-smoking. Arrival and Departure - Guests are advised that check-in time is from 2.00pm and check-out time is prior to 10.00am on the day of departure. The office is open Monday to Sunday 8.30am to 6.00pm. Should you arrive after 6.00pm, self-check in can be arranged and we ask that you contact us for more information. Parking – As per strata by-laws each cottage has parking for two (2) vehicles. Visitor’s cars or extra cars can be parked at the visitors car park located near the pool. There is strictly no parking on the road or lawns. Boats – We don’t offer facilities for parking of large boats, please contact us for more information on where you can park large boats in vicinity. Internet – Free Wi-Fi access is provided in all the cottages. Visitors – The person who has made the booking is responsible for the conduct of visitors and we ask that all visitors adhere to the property terms and conditions. Noise – We ask that all guests that aren’t staying in the cottage/s depart the property by 10pm and give respect to other guests around them by keeping the noise to a minimum. There is to be no loud noise after 11pm and management reserves the right to enter the cottage for inspection at any time. Failure to meet this booking condition may result in the client being asked to move inside and if the noise problem continues, management have the right under the Innkeepers Act to ask the client to leave the property with no refund applicable. Linen - All linen is supplied, including sheets and towels, however we don’t supply beach towels. Cleaning – Cottages are to be left how you found them in regards to cleanliness. It’s expected that the cottage/s are left tidy, with the dishwasher emptied and the rubbish removed. Failure to meet this booking condition may result in an additional cleaning fee being charged to your credit card. BBQ’s – We ask that BBQ’s are not moved during your stay and that gas cylinders are turned off after every times it’s used. Rubbish – Two bins are provided for each cottage, one for general rubbish (green lid) and one for recyclables (yellow lid). The green bins are emptied every Tuesday morning and the recycling bins every 2nd Tuesday and the bins will be collected from the cottages on Monday afternoon ready for collection. Should you have rubbish to dispose of during this time, please take it to the bins located at the front of your cottage. Consumables – Our cottages are rented as self-contained accommodation, however we do provide a small amount of essential items, which includes toilet paper, milk, tea, coffee and sugar. It’s the client’s responsibility to re-stock their consumables for the duration of their stay. Baby Needs - We offer cots free of charge, however this must be booked at the time of making the reservation. In addition each cottage comes with a high chair and stair guards free of charge, for your child’s safety. Property Damage – Any damage or breakages to items, property or common area’s must be reported to management prior to departure and a dependant on the situation, may incur a damage fee. If the damage/breakage isn’t reported to management, a fee will be charged to the credit card to cover the cost of the repair or the replacement. This also applies to missing items, as they will be deemed ‘broken’ and be charged to the credit card accordingly. Items Left Behind – If items are left behind, they will be held for collection for up to 3 weeks. Should they not be claimed, the items will be donated to a local charity. If items are to be returned, it’s the guest’s responsibility to provide a stamped self-addressed envelope for the return of lost property. Insurance – We suggest that client’s take out travel insurance to cover any unforeseen circumstances that may occur (booking cancellation or loss of personal items) and it’s the responsibility of the client to keep the property secure during theirstay. No liability is accepted for any injury, debt, damage, loss, delay, expense or inconvenience caused directly or indirectly by events beyond the control of the management. Cottage Ownership – Whilst the property is managed by Perth Management Services, the cottages are individually owned and are rented as fully self-contained accommodation. Where there is a fault and/or malfunction of appliances or inclusions, there is no obligation from the property owner or management company to offer a discount or compensation.